Like its name suggests, the Madrid Transporter was built to move you. It might not be as action-packed as the Hollywood blockbuster series by the same name, but who says you can’t make your own adventure? The Transporter is a cambered-out single kick longboard with mellow concave and room to fit large wheels. So whether you’re headed to the corner, or class, the Transporter is the board to get you there. 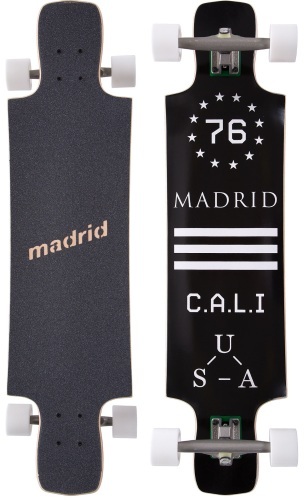 Comes with TR 180mm black trucks, Madrid Smoothride 70mm 80A wheels, diecut griptape, and precision steel bearings.